The 20-year-old, who signed to the Ferrari academy earlier this year, will drive for the Italian team in Bahrain - on Tuesday next - before testing for Alfa Romeo at the same venue a day later. 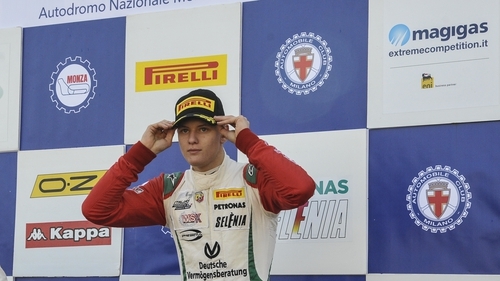 Schumacher Jnr, who begins his Formula Two campaign - the feeder championship to F1 - at the Sakhir Circuit later this week, said: "I am obviously more than excited and would like to thank Ferrari for giving me this opportunity. Schumacher Jnr's participation in next week's first in-season test will be seen as another major stride to following in his father's footsteps. Ferrari also revealed that their young British driver, Callum Ilott, will be handed his F1 debut in a test with Alfa Romeo at Barcelona's Circuit de Catalunya in May. Ferrari team principal, Mattia Binotto said: "We are firm believers in the value of the Ferrari Driver Academy (FDA), as a high-level training programme for talented youngsters and the decision to give Charles Leclerc a race seat with our team is proof of that.